Chaminade junior Chloe Talan was one of eight students out of 103 to be named best poster presentation at the Annual Biomedical Research Conference for Minority Students on November 17 in Indianapolis, Indiana. 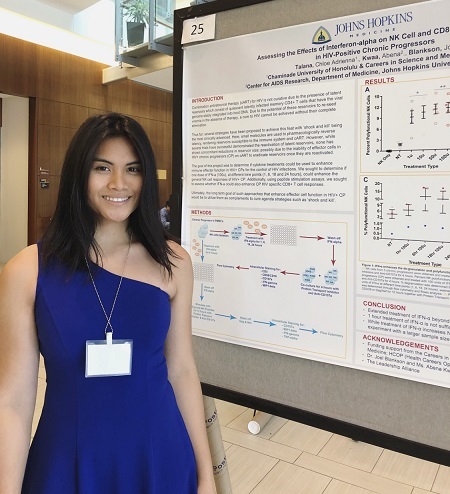 Talan studied blood samples from HIV infected individuals to document how their immune cells function as part of a summer research program at Johns Hopkins University. 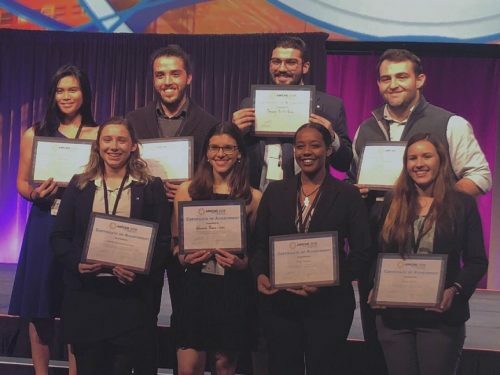 She first presented her research at the Leadership Alliance symposium in Connecticut and was invited to present her research again at the recent conference in Indianapolis. She attended the national conference with six other Chaminade students, three of whom also presented their research. Talan attributes her award to her ability to seize opportunities and the support she’s received from Chaminade professor Dr. Michael Weichhaus. Talan joined Dr. Weichhaus’s lab as a student researcher after she approached him after class one day and asked if he knew of any research opportunities. Dr. Weichhaus has encouraged Talan to pursue research opportunities outside of his lab, including the Johns Hopkins program. His mentorship has made such an impact on Talan’s experience as a student that earlier this year she nominated him for the President Mackey Prize, which he was awarded at the Na Liko Na’auao undergraduate conference at Chaminade University in March.